Your new glass worktops will give your kitchen that wow factor and ultra-modern clean slick look, with granite, Corian and timber being work surfaces of the past and let’s face it, a bit outdated. Glass is being used more and more widely now by clients looking to have a truly amazing kitchen. Contact us today to find out the prices of our glass worktops and get further advice. Create a lasting sense of contemporary style with brand new glass worktops from A1 Glass and Glazing. Right from the outset, whether you just want a quick price to see if glass worktops are within your budget or you want your new kitchen to look the best it can possibly be and wish to go straight ahead with a survey you can be assured you will speak to a helpful, dedicated and knowledgeable member of our team. When it comes to your installation, we don’t leave anything to chance here either, we can survey and supply you the best glass worktops in the industry. That’s why, no matter what one of our teams visit you to carry out your installation you can rest assured that the team leader will have no less than 20 years fitting experience within the glass trade and will have fitted 100’s of glass worktops to the highest of standards during this time. Cleaning kitchens can be a tedious job to do, especially when the worktops are stained from cooking. With our range of glass worktops available, we can guarantee it will be easy and hassle-free to clean, making it extremely low maintenance. All it needs is a quick wipe to ensure it is clean and kept looking brand new. We know that all kitchens are different shapes, sizes and colours, which is why we offer a range of customisation options for you to choose from. This ensures your glass worktop fits the aesthetic of the rest of your kitchen. 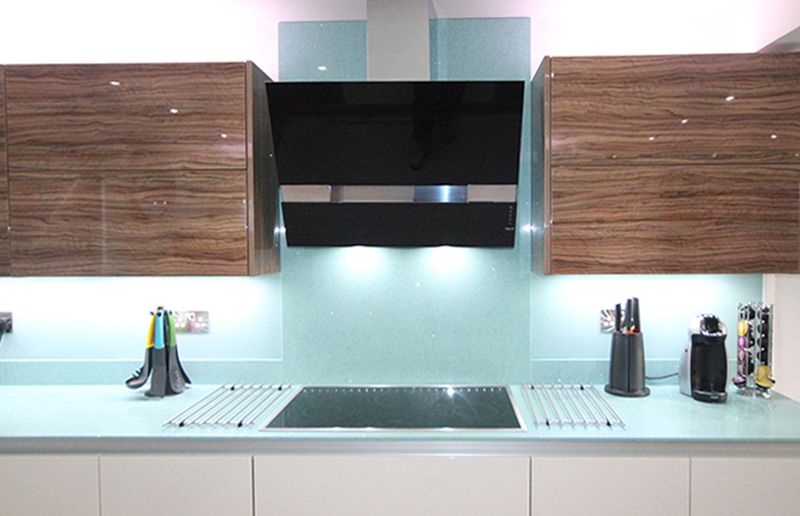 You can choose from a range of colours and glass finishes to enable you to fully customise your glass worktop. If you have a small kitchen, you won’t have to spend a fortune to make it appear larger. Installing a glass worktop enables you to create the illusion of more space. The transparency of the glass reflects light, making it look brighter and more open. If you’re looking to open your kitchen, our wide range of glass worktops are the perfect choice. We understand the importance of cleanliness in the kitchen, which is why glass worktops are an ideal choice for every home. The glass used ensures bacteria can be cleaned away easily and quickly, keeping your kitchen as clean as possible. Due to its resistance to heat, it ensures bacteria doesn’t survive and grow, keeping you and your family healthy and safe. Made from the toughest glass available, all our glass worktops are designed and manufactured to last longer than their counterparts. As glass is a strong, sturdy material, it is not prone to scratches and breakages, meaning you won’t have to replace it often. As it is heat resistant, pots and pans can go straight from the stove to the glass worktop, without damaging it. Updating the look and feel of your home doesn’t need to be costly. 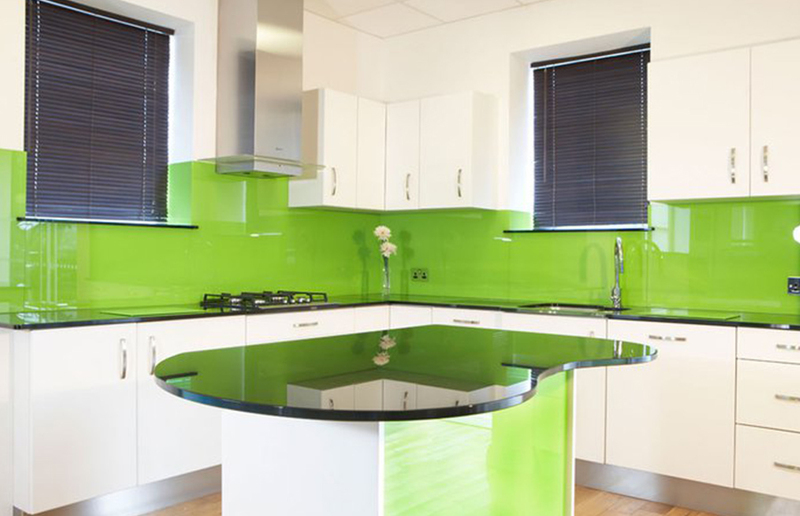 We can guarantee that with our customisation options, the range of glass worktops available are manufactured to suit all types of property, from home kitchens to office kitchens. It renovates the look of the home without costing a fortune. Its easy upkeep makes it an affordable investment. Installing glass worktops into your home combines increased natural light with beautiful aesthetics making it the perfect blend of form and function. The unique features enhance the look of your kitchen, making it more contemporary and light. Each glass worktop is installed by a team of experts, using years of experience to give you a product we guarantee you will be satisfied with. Their extensive knowledge and experience within the industry ensure they provide you with a professional service. The customisation options available ensure the glass worktops you order are perfectly fitted for your home. Using the variety of customisation options from colours to glass finishes enables you to create a bespoke product that will best reflect your home appearance. Glass worktops come in a wealth of different colours, sizes and shapes, which means they are not a one size fits all product. This means the price isn’t either. Give us a call and find out your bespoke price that reflects the product you desire today. Our team of trusted staff members will be on hand and ready to answer any questions you have, giving you a quote in minutes. Alternatively, you can send us an email using our online form and we will get back to you as soon as possible.